This is part 2 of an English translation of a round table discussion in Japanese from around 1988 with Yasuo Kobayashi and his younger sister, Fumiko Nakayama. 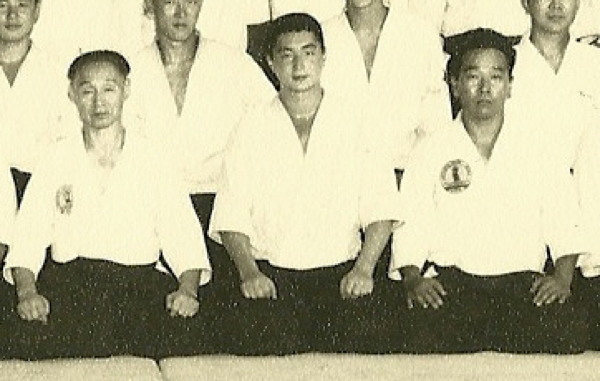 You may wish to read part 1 before reading this section, in which Kobayashi sensei discusses his interest in Japanese pro-wrestling, and a little bit about what training at old Aikikai Hombu Dojo was like in the 1950’s. 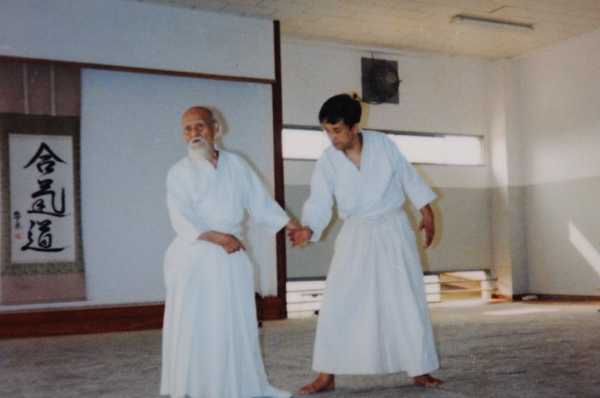 The first time that I recall seeing Kobayashi sensei was at the first Aikido Friendship Demonstration held in Tokyo by Stan Pranin and Aiki News. See “Yasuo Kobayashi: A Man of His Word” by Stan Pranin for an interesting story behind his participation in that demonstration. More information about Yasuo Kobayashi, and Aikido Kobayashi Dojo, is available on the Kobayashi Dojo website. Moderator: Was it two or three years after graduating from the university that you were sent out from Hombu as an instructor? Moderator: Were you able to develop real ability in three or four years? Nakayama: The training was very severe! Kobayashi: The training was severe, and we trained a lot. We’d just throw ourselves into it. Nakayama: It felt like whenever there was free time we would find a partner and start training. Moderator: Did you train harder than third and fourth year university students train now? Kobayashi: We did, didn’t we. Training at university training camps now is easier than our regular training was then. Kobayashi: We were young, so whenever we were in the Dojo we would try to crush each other. Moderator: So the uchi-deshi completed what would be ten years or more training for us in two or three years? Kobayashi: We didn’t go out to train, so after morning training finished we would play Shogi (Japanese Chess) or Sumo, or experiment with various approaches. That’s why I know some strange techniques! Moderator: Had you already enrolled at that time? 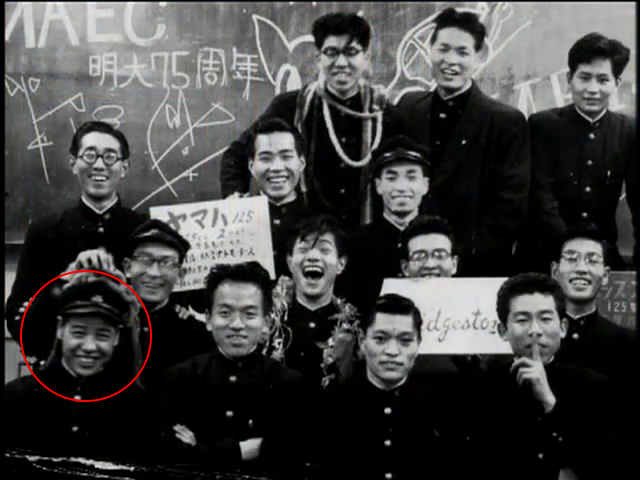 Nakayama: I started in Showa year 36 (1961), the year that I graduated from high school. Nakayama: I went to see Kobayashi sensei’s test – it was Nikyo and Sankyo, all painful techniques, so I went to see that. Moderator: Did Kobayashi sensei encourage you to go? Nakayama: No, I didn’t know anything about it, so I went to see if there was anything to it. Moderator: Where there already women training at that time? Nakayama: There were a few there, maybe two or three. Moderator: Are any of them still training today? Kobayashi: There was Tamura-san, Okubo-san…and the younger sister of Sunadomari shihan from Kyushu was there (Fukiko Sunadomari / 砂泊扶妃子). Nakayama: It wasn’t like now, when people throw you softly and gently because you are a woman, from the very first day you would be thrown vigorously. Kobayashi: There was no particular instruction in ukemi. Kobayashi: Ukemi and those things were not taught, we would do suwari-waza, so you would naturally roll around from a low height. However, those you couldn’t endure it would end up quitting. Nakayama: We would do Nikyo or Sankyo/Yonkyo until you just couldn’t take it anymore. I’d return home with both arms hurting so much that I couldn’t lift them up, and there were times when my hands were too swollen to hold a pair of chopsticks. Kobayashi: There were many people who had done some kind of Budo before, so we were comrades right from the start. Nakayama: While sharing in their severe training, in some unknown place inside of me I found that I was able to keep up. Kobayashi: That’s because the focus was on suwari-waza. Moderator: You weren’t taught systematically, the way that you are now? Nakayama: You weren’t taught, the only way was to to study on your own. All that Sensei would say is “Hai, Nikyo’s next”. Kobayashi: And there wasn’t any explanation. Nakayama: If you just kept training, at some point maybe you would understand…. The style was to somehow learn each thing naturally through the body. 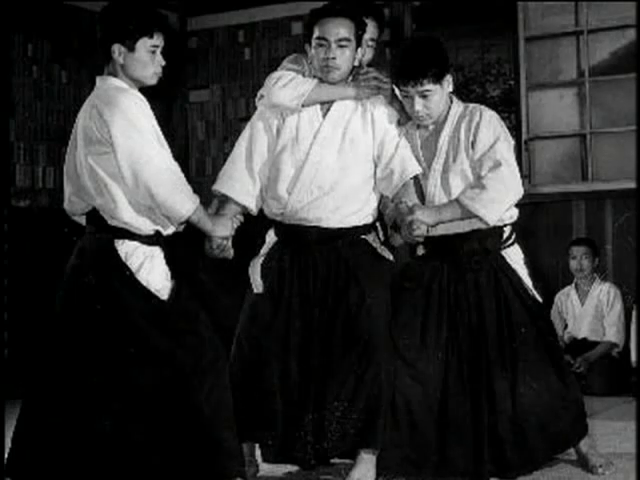 Kobayashi: Even now some of the older instructors teach in this manner. That was the reason that I began gathering beginners together for instruction separately. Moderator: Did you start that after the new building (Aikikai Hombu Dojo) was completed? Kobayashi: Even before that, when I was instructing I would tell the beginners to come over here and gather them together, although it’s much more trouble, since if I let them do whatever they want I would be able to practice myself as well. However, I want even one person to improve. Moderator: So even at that time you were using the current methods in your own way. Kobayashi: That’s right, thinking in my own way. When Doshu or the sempai gathered together I would voice my opinion. They were positive while I was talking about it and then…. The one who was good at it was Tohei sensei. That’s why he was popular. However, if you regulate things too much the Yudansha don’t like it. Even if you tell people they must do it one way there were some people who would go their own way. Beginners appreciate it. 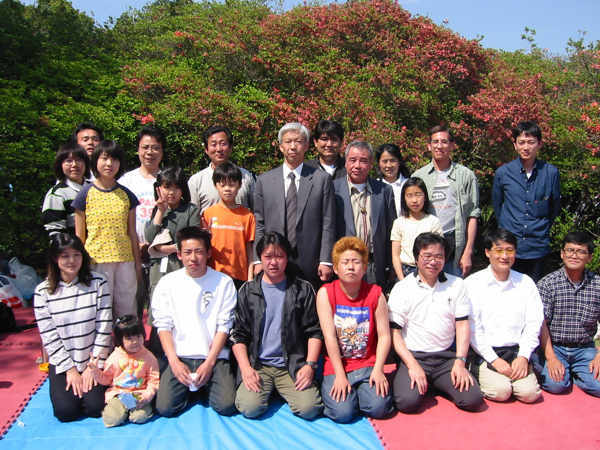 Tohei sensei was the one who started the children’s class. Moderator: Around what year was that? 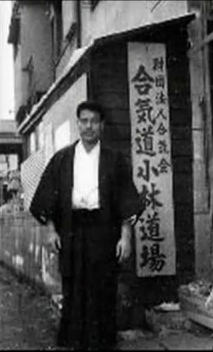 Kobayashi: After the building (Aikikai Hombu Dojo) was completed. Moderator: Did Aikido begin to spread from that time? 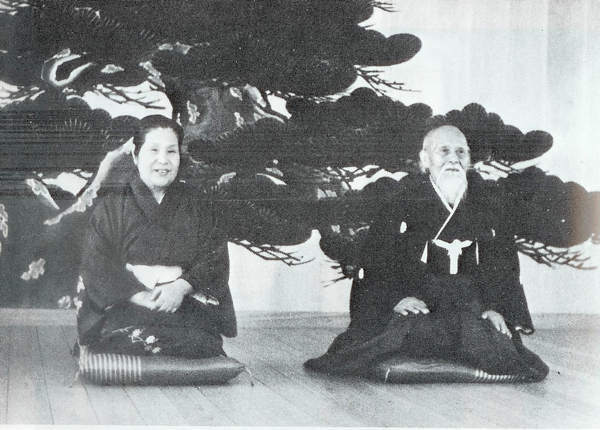 Kobayashi: Doshu quit his job in Showa year 32 (1957), at that time the Yoshinkan was more vigorous. Their name was appearing in the mass media. 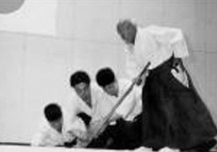 What Doshu did is to promote the popularity of Ueshiba Aikido. 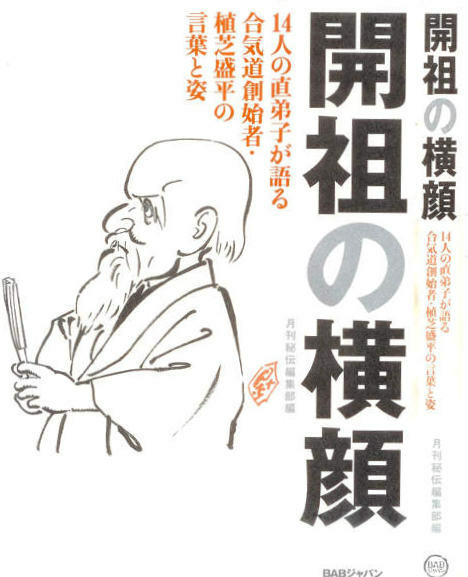 Because it’s a thing created by Ueshiba sensei. Once the older students came home and got their lives settled they would come to visit. In the mass media publication of weekly magazines resumed and there was a boom in television and radio – at that time he struck out in full force with Ueshiba Aikido. Moderator: Was it at that time that the first demonstration was held? Kobayashi: The first demonstration was held in Showa year 30 (1955). That was right after I started. The first one was held in June on the roof of Takashimaya. They began from that time. 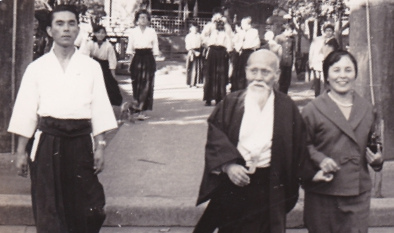 Until that time demonstrations were all done by Ueshiba sensei alone, everyone else only took ukemi. For that reason it was revolutionary. Doshu convinced him to do it for the future growth of Aikido. Moderator: When was the demonstration where Kobayashi sensei is seen pushing on the jo? Kobayashi: That was my first demonstration, at Yamano Hall. Nakayama: The one at Asahi was around Showa year 37 (1962). Moderator: Even at that time, did the Founder dislike public demonstrations? Kobayashi: That was true for the first few years, but he eventually resigned himself to the changing times. Nakayama: Speaking of the female demonstrations, we would have to take time off of work for the demonstrations, and anyway the number of women was quite small – we were sent out to quite a few locations. Kobayashi: In between O-Sensei would take a week off for training camps. Moderator: What was the content? Kobayashi: O-Sensei would teach them, so it was talk of the Gods and such, I don’t think that there was any sense of performing techniques in a system. Nakayama: And things like ○△□ . Kobayashi: Photographers would come to take pictures, but even if they liked something and asked him to do it one more time he would never repeat a technique. 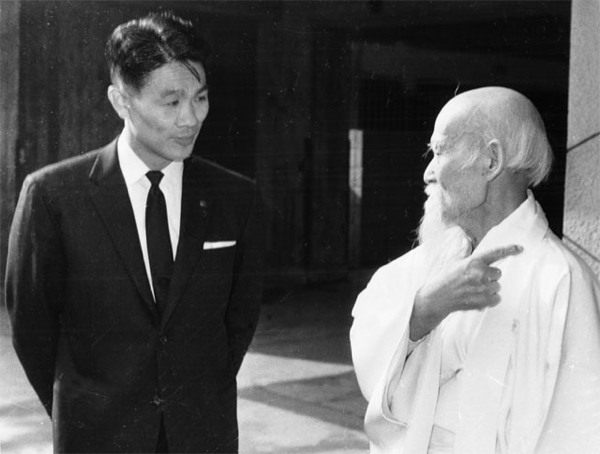 Moderator: There were two books published before the war, “Budo” and “Budo Renshu”, was it only those techniques? Kobayashi: Yes, that’s right. Of course, we did not do staff (jo) or sword (ken). Moderator: Did O-Sensei use the words “Ki” and Kokyu-ryoku”? Kobayashi: He would speak to us using the names of the Gods, so I don’t really know – the one who taught us clearly and understandably was Tohei sensei. Nakayama: O-Sensei was very friendly towards the women. When you grabbed a hand or a foot he’d say “Do it like this…”, we were very happy. Moderator: Was O-Sensei in his seventies at that time? Moderator: What did it feel like to grab O-Sensei’s wrist? It wasn’t like being thrown by a normal person, it felt as if you were sinking into the tatami. From that sharpness things mellowed over the years and come to be expressed in Kata. We who were there take ukemi based upon our experiences from that time, but those who have only seen the later form don’t really understand. That in and of itself is a reason for the change. Nakayama: His forearms were extremely thick, since you couldn’t wrap your hands around them it felt as if you were just touching them. Moderator: Was his musculature normally soft? Kobayashi: I often gave him massages. My fingers couldn’t sink in, it was very tiring. Moderator: Even at that age? Kobayashi: Even if you pushed nothing worked, but through that you would come to understand O-Sensei well. It was hard, giving those massages every night… His muscles were slightly slack, but the muscles in his back were like bumps. Moderator: What was his training like? Kobayashi: You would spring up and when you were told “Come!” it felt as if you had no choice but to go (and be thrown). Even the photographs have that kind of impact. Even when he told you to come strike him you couldn’t move. But in the end there was nothing to do but go. You felt as if you were trying hard, but you would be handled like a child, after a couple of times he would move slightly and you would instantly fall. First of all this (the heart) was being suppressed. When you were holding a sword or something, he would strike a hanmi stance and say “Come strike!”, but you still found yourself unable to move. Moderator: What about sword and staff (jo). Kobayashi: O-Sensei would do those things, but each time that he did them it was different, so each of the instructors who recall that time remembers it differently. Well, anyway, the way of cutting doesn’t change so much. Moderator: Have you ever thought that you cannot understand Aikido unless you understand O-Sensei’s talk of the Gods? Nakayama: Our legs would fall asleep, and it was cold – it was really hard in the winter. Sometimes technical training would finish in ten or fifteen minutes. Moderator: Which Gods did he speak about? Kobayashi: From Oomoto-kyo, I guess. (大本教). Nakayama: People came from Oomoto-kyo too. Those kind of people would nod along to O-Sensei’s lectures. Moderator: Event if you don’t understand religious matters you can do Aikido, the techniques are very rational. Kobayashi: Yes, that’s because training is enjoyable. Moderator: Nakayama sensei, what techniques did you learn when your were taught directly by O-Sensei? Nakayama: Ikkyo, and suwari-waza, do it like this, or like this. I was told that I had more potential than my older brother. Kobayashi: Hahaha. (explosive laughter) He really told her that! Moderator: So, did you have potential after all? Nakayama: I wonder…. It’s just that Aikido is something that becomes engrossing, once you become fascinated with it, then if you have free time you train, train and go to the dojo for the whole day – when I had to work I often commuted in the mornings and the evenings. Moderator: As to the severity of Nikyo, when Nakayama sensei applies it to you it’s really effective. As if you are shocked by electricity. Nakayama: That must be because I learned it through my body. Moderator: Of course, Kobayashi sensei is the same way, but recently has he become kinder? Nakayama: Me too. (laughing) Since we did severe training with the old instructors. Moderator: I have been told that in the old days training was limited to Ikkyo and Irimi-nage. Nakayama: No, that’s not true. Moderator: Did O-Sensei come out for most of the training sessions after he emerged from Iwama? Nakayama: Well, only when he felt like it, but sometimes I think that there were times when he felt that he had to come out. Moderator: There were times when he felt like that? Nakayama: O-Sensei’s lectures were very difficult and hard to understand. Amaterasu O-Mikami or something or other. Moderator: Kobayashi sensei, are there many parts of your Aikido that are a product of your own conception? Kobayashi: He’d say “like this”, but O-sensei would absolutely never say “do it this way”. The same when cutting with a sword, he would never talk about the details of how to hold it. He would show the form (the Kata), and that would be it. When you practice for many years your own ideas begin to creep in, and Doshu never regulated things. Nakayama: The best way was to attend the classes of many different instructors. Like Tohei sensei, Yamaguchi sensei, Tada sensei, Okumura sensei, Arikawa sensei, etc.. Attend the classes of various teachers and from there grasp your own techniques. Kobayashi: Whether that was good or not, I don’t know. Nakayama: That’s what I did. Moderator: If you wanted to, you could practice five times a day. Nakayama: That’s right, in the time between you were free, so after practice you could grab a partner… We really trained a lot.